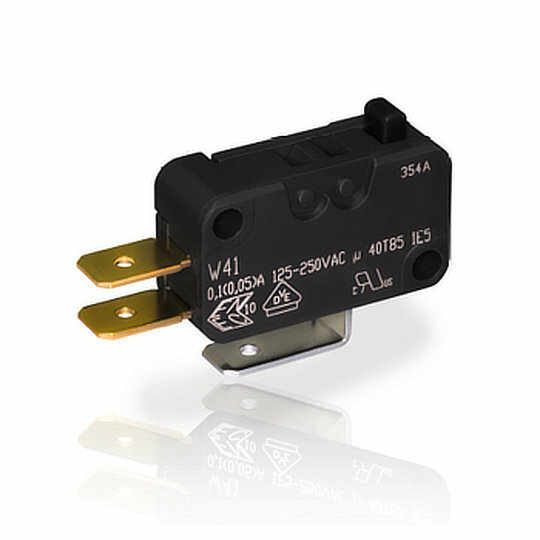 The W4 series of miniature microswitches from ZF are single pole, single or double throw switches with a wiping contact system suitable for special requirements such as capacitor loads. The W4 series has a miniature size of 27.8mm (w) by 15.9mm (h) and 10.3mm (d) and a variety of terminal configurations. The W4 series of miniature microswitches from ZF are single pole, single or double throw switches with a wiping contact system suitable for special requirements such as capacitor loads. The W4 series has a miniature size of 27.8mm (w) by 15.9mm (h) and 10.3mm (d) and a variety of terminal configurations. Electrically rated up to 6A at 250VAC with a mechanical life of 250,000 cycles up to 500,000 cycles depending on circuit current. The W4 series is available with a choice of straight, roller or simulated roller lever actuators with an operating force of 45cN up to 400cN depending on model. The W4 series are perfect for applications such as Home Appliances, White Goods, Linear Drives, Pressure Switches, Pneumatic Valves and Float Switches.